In an effort to expand his social network and give acting a try, Jeff joined DreamStreet Theater Company, a non-profit providing training and a platform for actors with developmental disabilities. Through his experiences at DreamStreet, Jeff met Dr. Laurie Yankowitz, HeartShare’s Director for Individualized Supports and DreamStreet Program Advisor. 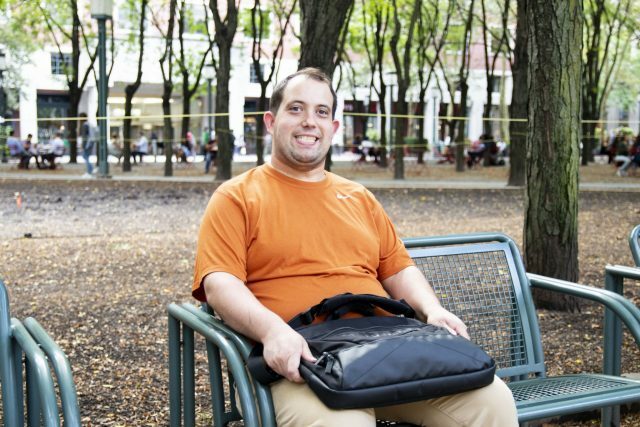 Jeff and his parents subsequently learned about HeartShare’s Self-Direction support broker services, which provide highly individualized assistance to allocate government funds for people eligible as determined by the NYS Office for People with Developmental Disabilities. Self-directing includes the option of being a co-employer of support staff – something that was very important to Jeff – as well as providing housing subsidies, funds for gym memberships, and community classes – all supports Jeff has elected to use. In order to move towards greater independence, Jeff wanted to be more financially savvy, as well as to secure a full-time job. Laurie worked with Jeff on developing a plan that included budgeting and tracking spending as a goal. The direct support professional Jeff hired – also someone he knew from DreamStreet – has been doing a great job of assisting Jeff with this challenge. Laurie also supported Jeff in his search for a job. She recommended that Jeff look into an organization’s employment services. This resulted in his part-time facilities role at JLL. Jeff is proud of his job and to live on his own in Yorkville in an apartment his parents helped secure. In his spare time, Jeff hits the gym for a workout and sometimes, a swim. Last summer, Jeff had the opportunity to visit Argentina and hopes to travel again soon. In addition to guidance from Laurie in her role of support broker at HeartShare, Jeff also attributes his progress and growth to his parent’s love and support. His father is a Ph.D. psychotherapist in private practice who also does real estate on the side, and his mother is an occupational therapist who works with children. Laurie has worked closely with Jeff’s mom on helping him work through his own decision-making process. “Laurie has been a key person in developing Jeffrey’s self-direction and progress. She is kind, caring and open,” shared Jeff’s mother. Through his facilities job at JLL and Best Buddies, Jeff continues to strengthen his professional connections. “I wanted to be in business when I was younger—and that’s what I’m doing,” Jeff said proudly.